Divided is split into seven sections: Overview, Income Inequality, Education, Health Care Inequality, Debt and Poverty, Policy and Family. The first two sections take up almost half of the book, which makes sense since income inequality is related to inequality in all of the other areas discussed later in the book. The writers talk about the history of inequality in the United States, and the fact that the divide between the rich and the middle class and poor has grown substantially in the past few decades. Many statistics stand out, including one highlighted in the book's jacket: "Shockingly, from 2009 to 2011, the top 1 percent got 121 percent of the income gains while the bottom 99 percent saw their income fall." 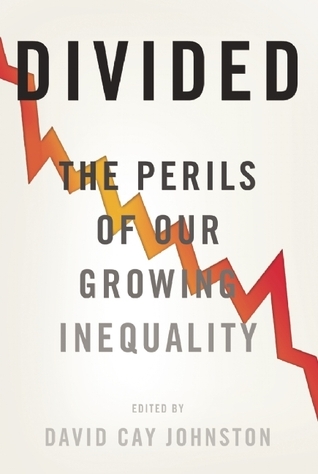 Divided: The Perils of Our Growing Economy is a great collection of thoughts on the issue of inequality in America. It definitely leans toward the left in terms of political views, but it is a real eye-opener in terms of understanding inequality, education, economic policy and other aspects of our country that are affecting each and every one of us today. Be sure to check out other blogs about Inequality by visiting the Blog Action Day website or check out #BAD2014 or #inequality on Twitter.